We provide a high quality of PLC Based Systems. We offer PLC Based Automation System to our clients. We bring forth a comprehensive range of PLC Integration. These low cost machine-automation systems are based on embedded technology for OEM's as well as PLC control panels with HMI interface or web enabled SCADA system. We are offering custom design and manufacturing of PLC and PLC Based Automation System for electrical, electronic and communication control panels etc. It is programmable logic control system and is available in different specifications. We are one of the most well-distinguished companies in the market that are into offering PLC System. We have vast industry experience in designing and integrating PLC Systems. As per this solution, we can meet both low cost as well as high cost machine automation systems based on embedded technology for original equipment manufacturers. 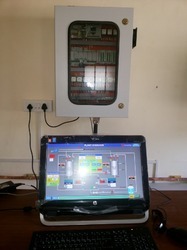 Further, clients can also avail PLC control panel with HMI interface from us at cost effective prices. Model Number: As Per Application.